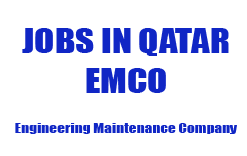 EMCO is one of the most prefered MEP Service provider in Doha, Qatar. Established in 2002 in Qatar, Currently Employs over 2500 Employees in Qatar. We known for our consistency, reliability & customer satisfaction. Customer satisfaction is the hallmark by which we measure our performance.Our quality assurance team ensures the highest degree of quality and accuracy for each drafted project as per the defined quality standards. Submit Your CV & Passoprt Immidiately with 15 Pcs. White Background Photos.